They say that popcorn was introduced in movie theaters as a sneaky marketing ploy intended to save the flailing movie business. Well, we ain't complaining. The tantalizing aroma of melting butter that wafts into the movie hall is enough to lure even the most discerning customer to make a beeline for the concession stand. But it was a chance discovery on one winter evening that led to the creation of this article about the best popcorn maker. While staying in an Air BnB I was pleased to find the kitchen well-stocked, and it included a popcorn popper. Well, let's do a proper movie night, I thought. Netflix and chill! I was impressed with what the little gadget produced. It shouldn't be so easy! But each kernel exploded with the crunch and flavor that has almost become gospel for generations of Americans. The idea that Netflix and a popcorn machine could deliver the same experience as a cinema right at home was a tad disappointing at first. Would future generations lose the magic of the shared movie experience? Maybe, but probably not. In any case, I was curious and wanted one of these gizmos for myself. And I started my quest to find the best popcorn popper. In the course of the journey, I discovered so much about these dainty little machines that I can very well call myself a popcorn maker savant. If you are also considering bringing a popcorn maker home, then here are some things that you need to know before you venture out to shop. First things first, you might just be amazed at all the tech-talk that’s thrown at you when you are shopping for popcorn makers. There’s wattage, kettle size, material, the warming deck and a lot more that can affect the quality and the quantity of popcorn that you can churn out. How Much Popcorn Do You Intend to Make? While some people would like to gnash a few kernels of popcorn at home while watching a movie, others like to entertain their guests with a never ending supply of popcorn at parties. Your intended use will determine the size and the type of popcorn popper you need. The term commercial machine can be a misnomer. The size, wattage and features in these machines are more suited for commercial and all-day use. But that does not mean that you cannot get one of these for home use. In fact, one of these would be ideal for extended families with popcorn addicts and for a weekend home that is used for parties. Machines made for home use on the other hand are compact and often lack the bells and whistles that commercial machines have. But like I mentioned earlier, if your intended use is at home, then a commercial machine will be overkill. 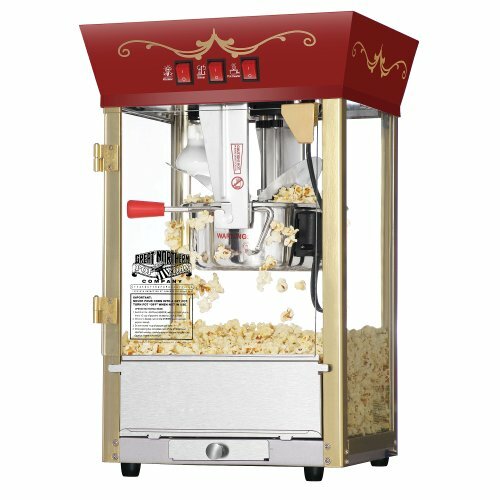 There are three types of popcorn machines. The traditional ones have a hot oil kettle and usually have a tabletop design. These are designed to look and feel like the vintage popcorn machines that we are so used to seeing, which adds to the aesthetics. These machines typically include butter dispensers, warming trays and compartments to collect the popcorn. Hot air machines are for the health conscious popcorn lovers who would like popcorn without compromising on the flavor or the taste. These use hot air to pop the kernels and are usually larger than tabletop units. The obvious advantage is that these are priced a lot lower than an oil kettle popcorn unit. Last but not the least; stovetop popcorn makers let you pop the corn on any stovetop without the need for electricity. The Kettle size will determine the yield of the unit. It is measured in ounces and often, you will see popcorn makers advertised according to the kettle size. The standard sized machine is 4-8 oz while larger machines can be as big as 32 oz. On average, an 8 oz. machine can produce up to 150 standard sized servings of popcorn an hour. Anything above 4 oz. is usually considered to be ideal for commercial use. The Wattage is undoubtedly one of the trickiest aspects of shopping for popcorn makers. The rule of thumb is that the higher the wattage, the faster the machine pops the kernels. But faster does not equate to tastier. I have discovered that some high wattage popcorn machines do not produce the classic crunchy kernels and leave a lot of kernels unpopped. That just about sums it up. I have left out a few factors like the material and the heating element which can be too technical in my opinion. Without further ado, here’s my pick of the best popcorn makers in the market. My selection is based on my experiences with these machines. I have also spoken to people who have used these machines for quite some time in addition to analyzing the features and the durability. 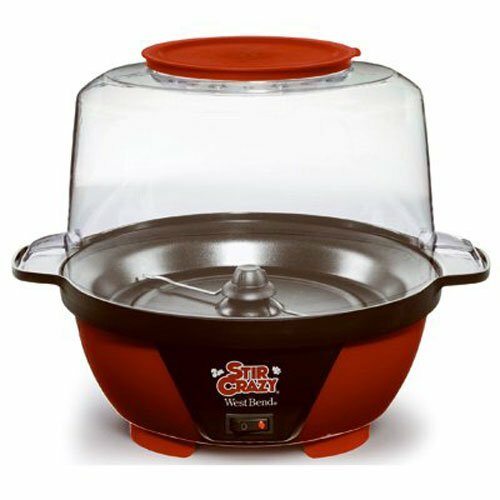 Presto have been one of the most popular popcorn makers for home use for decades. Some of their early models like the Popcorn Now have been used by customers without a problem for years. The PopLite is the recent iteration of their flagship model. It also happens to be the bestseller in the ‘Popcorn Poppers’ category on Amazon. Well, for a category that has thousands of products, that is no mean feat, folks. 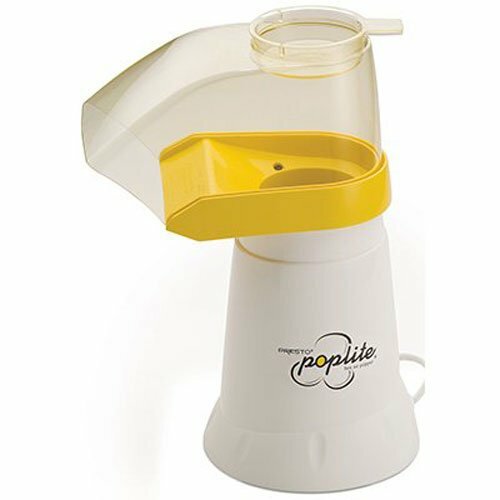 What makes PopLite so popular among Popcorn lovers is its incredibly fast popping time with virtually no unpopped kernels. That clubbed with a consistent and reliable hot air popper makes this a health conscious choice too. The Presto Poplite has a very unassuming appearance for a product that has been voted #1 by thousands of users. But the simple design is precisely what makes this so appealing. It is incredibly easy to use, pops the kernels faster than a microwave and you can use both gourmet and regular popcorn varieties with it. It is a calorie counter’s dream machine. It pops corn that measures a mere 30 calories a cup without any added flavors or preservatives. 100% pure air-popped popcorn just the way it is meant to be. And if you are looking for the occasional indulgence, all that you need to do is add some butter to the measuring cup and watch it melt and drip into the kernels as they pop. An intuitively designed plastic corn chute directs the popcorn into the bowl. While the parts are not dishwasher safe, the Poplite rarely demands a detailed scrubbing. In most cases, a wipe down with a dry cloth suffices to make it as good as new. There are very few unpopped or burnt kernels with the PopLite. Verdict: Presto’s Poplite continues on the premise that simplicity works best. The design has remained largely unchanged over the years. But why fix it when it works? This is one of the best popcorn makers in the market. If it's air popped corn you want, then you have just found your best choice. My #2 pick is this movie theater styled antique popcorn maker from Great Northern. As the name suggests, this is designed to mimic a traditional movie theater popcorn machine. It has a stainless steel body and a tempered glass window which lets you see the corn kernels getting popped. The 640 wattage allows fast and consistent performance. This popcorn maker is available in two design choices. The first one is a countertop model that can be installed just about anywhere that you want. The dimensions are 14.4 inches (length) x 13.6 inches (width) x 22.8 inches (height). On the contrary, if you are looking for something that is portable, then you can choose the cart design that comes with bicycle styled wheels that includes a storage cabinet allowing you easy access wherever you need it. This has an 8 ounce kettle which makes it perfect for occasions when you need more popcorn than normal. There is also a drawer where unpopped kernels – referred to by those in the know as “old maids” - are deposited, meaning the popcorn you take out of the popcorn maker will be the light, fluffy snack you were hoping to enjoy. The “old maid” drawer also makes disposing of unpopped kernels a breeze. On an average, it pops 2-3 gallons of popcorn per batch and the unpopped kernels are collected in a reject tray which can be removed and cleaned easily. There is minimal splatter and if you do find the occasional kernel finding its way out of the unit, then you can add some weight to the front and rear lids to prevent this from occurring. This is one of the few popcorn makers that come ready to use out of the box. There are three easily accessible control switches to activate the warmer, stirrer and the pot heater. All that you need to do is preheat the machine for a while, add oil and popcorn and sit back and enjoy deliciously crunchy popcorn. By the way, the popcorn is popped to perfection. It is not chewy or undercooked. Turn on the warming light and the popcorn stays crunchy for hours after you have made it. Verdict: This is a great popcorn machine for anyone looking for the authentic movie theater experience. It produces a good quantity of popcorn in very little time. Contrary to what some people believe, a stovetop popcorn popper does not alter the taste or the crunchiness of the corn. In fact, it is one of the most portable and easiest ways to pop some authentic tasting corn at home without investing into an electrical machine. Franklin’s Whirley Pop is one of the oldest stovetop poppers to have been introduced into the market. Guess what? It still works as well as it did years ago. One of the reasons why Franklin’s Whirley Pop continues to outsell a lot of its higher priced competitors is because of the flawless construction. Everything from the aluminum kettle for even heat distribution to the metallic gears for uninterrupted stirring are designed for long term use. The stirring mechanism is patented and it results in very few unpopped or burnt kernels. Using the Whirley Pop is as easy as it gets. All that you need to do is heat the popper for a few minutes, add your butter, oil or seasoning and the corn and keep rotating the gears until the popping stops. A wooden handle ensures that you don’t burn your hands as the kettle gets hot on the stove and you can easily lift it off once done. It takes approximately 3 minutes to make almost 6 quarts of popcorn. That’s double the size of what you can make in a microwave. Verdict: With Franklin’s lifetime warranty and a great customer rating on most online retail portals, this is a no-brainer. The Whirley Pop is hands down the best choice if you are looking for a stovetop popcorn maker. Franklin's Whirley Pop Stovetop Popcorn Popper. FREE Popcorn Included..
Nobody said that popcorn poppers needed to look mundane or vintage all the time. Certainly not, if Disney manufactures it. 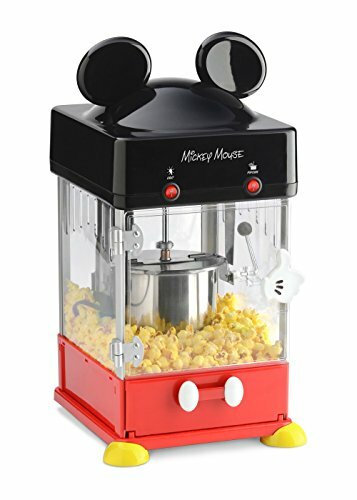 This is a kettle styled popcorn popper designed like Mickey Mouse himself complete with a red base, yellow feat and plush black ears on top of the unit. It goes without saying that if you are entertaining; this is going to grab some eyeballs. To top it off, it makes deliciously crunchy popcorn in very little time. The standout feature of this kettle styled popcorn maker is the cute design. For diehard popcorn lovers who are finicky about the taste, you should checkout the other models in this list. This is intended to add some eye candy to your counter which makes it a great choice for a gift item this holiday season. Everyone from children to adults will love Mickey Mouse popping corn on the counter. It features a 2 oz. 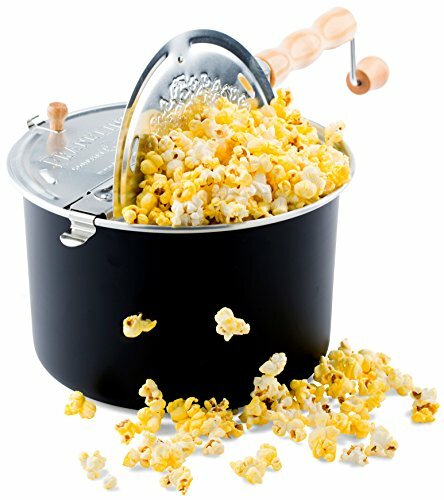 kettle that can make up to 8 cups of popcorn at a time. There is a heating light which keeps the popcorn crunchy and tasty for hours even after you make it. The popcorn is collected in an easy-to-access slide out tray. Also, the popper is extremely easy to clean. The package includes four Mickey Mouse serving containers, oil and kernel scoops. All that you need is your favorite corn and you are ready to bite into delicious pop corn at home. Verdict: This is a beautifully designed popcorn maker that is extremely easy to use. With a 2 oz. capacity and a compact footprint, it is perfect for home use. Hard to go wrong with it! If you've gone to the effort of buying a top popcorn machine, filled it with premium gourmet unpopped popcorn from one of the top popcorn kernel brands, topped it with delicious healthy popcorn oil - then don't go and serve it up in a plain white bowl! To complete the set and REALLY have a traditional, authentic nostalgia-filled movie night experience you need to invest a few extra pennies in some traditional paper bags. These red-and-white bags are perfectly designed to be maximum eye candy, and hold 4 cups of fresh, hot, perfectly formed popcorn. The West Bend 82505, available in red or black, offers genuine practicality. 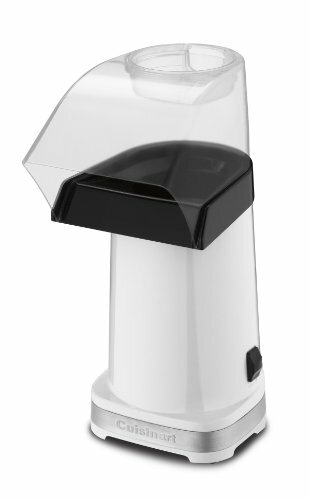 The lid of the popcorn popper doubles as a bowl for the finished popcorn, while the cord wraps away under the machine, avoiding unsightly, dangerous counter top tangles. The bowl is dishwasher safe, and the West Bend can also be used for roasting coffee, making it an ideal addition to the kitchen of any all-round gourmet. However, it does have a tendency to cook popcorn unevenly, burning some kernels whilst not popping others. It also spits kernels, and therefore it is important to ensure the lid is firmly on while the popcorn maker is in use. The Cuisinart CPM 100 Easy Pop comes in four colors, including a modern, stylish metallic red, and includes convenient cord storage. It is easy to clean, with all removable parts being dishwasher safe. Like the Poplite, the Easy Pop's measuring cup can also be used to melt butter to drizzle over your finished popcorn for a delicious, old-fashioned taste and fantastic flavor. The Easy Pop produces fresh, crunchy popcorn, although it is important to note that it cannot handle small kernels, such as those used in Amish County Baby White Popping Corn. The Easy Pop would also benefit from a less flimsy shield and closer fitting lid, as it does have a tendency to spit hot kernels whilst in use. Finally, the Hamilton Beach 73400 is a large capacity popcorn maker, which can take up to 16 cups of kernels per use, resulting in eight sizeable servings of popcorn. 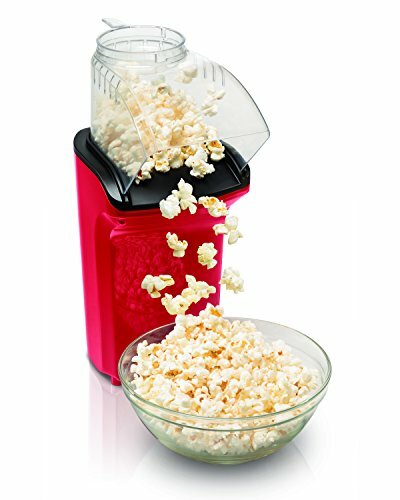 The 73400 is easy to clean, and as with other popcorn poppers, the measuring cup can also be used to melt butter. Despite its large capacity, the Hamilton Beach would sit neatly on a small kitchen counter, so would be a good investment for apartment dwellers who still want to enjoy their hot, buttery snacks. However, it does produce a lot of flying kernels.